Have you ever wondered where to go when you want to learn the Japanese language, contact English-speaking local nationals, or take part in cultural events? If you have and still haven't found the way to go, Okinawa City International Association can lend much more than a helpful advice. Founded in 1989, Okinawa City International Association (OCIA)helps promote friendships and a better understanding between Japanese and non-Japanese communities through cross-cultural exchange activities. Under current president, Masaru Matsudou, approximately 100 members including a 22-member board of directors, make up the association. To provide people from different linguistic and cultural backgrounds opportunities to better understand one another, and have a load of fun together, OCIA plans to hold cross-cultural exchange events throughout the year. Upcoming events include the Okinawa City International Exchange Festival, Potluck parties, the Golden Run (marathon race), with more to be scheduled. 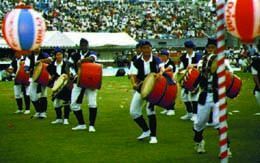 Among them, the All-Okinawa Eisa Dance Festival will be held on August 28 and 29, and is one of the major summer events in Okinawa City to attract thousands of people from all over the island, both as spectator and participant. In fact, OCIA has its own Eisa dance team scheduled to perform on the 29th, and is inviting anyone interested in taking part an opportunity to come along and join in dance practices before the big event. Eisa dance practices are held every Monday, Wednesday, Friday from 6:30 p.m. to 8 p.m. at Ryokuju-en in Okinawa City. The only outlay is for the costumes, and all participants must contribute $25 or ¥3000. For more information, call 939-1212 (ext. 2421). English-speaking staff can answer your questions. Also, OCIA begins Japanese language lessons this August. The course begins at the introductory level and students will learn basic Japanese conversation over a two-month period.. The fee for the course, which includes 10 lessons and a potluck party, is ¥3000 for non-OCIA members and ¥2500 for OCIA members. Classes are held on Mondays from 7:30 p.m. to 9:30 p.m. For those who wish to enroll, sign ups must be completed by Friday July 23. For more information about enrollment, call 939-1212 (ext. 2421).